Traditional didactic modes of teaching, while efficient for testing, are crippling for depth of study and critical thought for learners. As experienced educators, we have taught in public, private, 'elite', international, urban, underprivileged, and 'non-traditional' schools; the trend is toward standardization of content delivery and retention across the disciplines. We'd like to change that. The visual above represents elements that allow us to answer our driving question: "How can we as humanities educators enable hands-on, project-based learning within archives, so that learners uncover knowledge and develop skills for life?" The reason we begin with a question is because it is, itself, sound practice of critical thinking and inquiry learning. Critical thinking is at the core of our model and is a skill for life. Seldom do we hear that 'critical thinking' is a skill. However, if we break 'critical thinking' down into sub-categories we can better practice it purposefully. For example, critical thinking is made up of gathering appropriate information, analyzing information, and synthesizing and creating ideas based upon the information. Rather than gather information passively (like reading a textbook or listening to a lecture), we encourage and enable learners to interact with primary sources and literally uncover content. 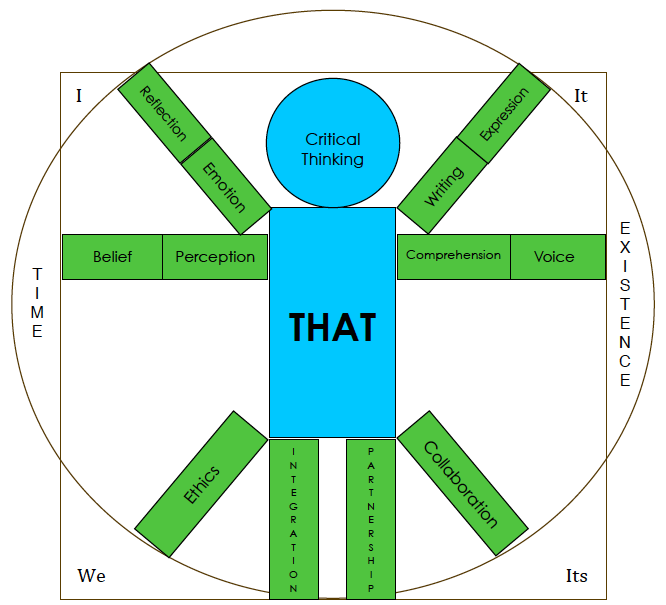 In the process of uncovering humanities content, learners will encounter and hopefully engage with each element (in green boxes above) in our model. These include other life-long skills like written communication, oral communication, and collaboration. When students create a project from start to finish they also develop work ethic skills. Study of the humanities is changing, due in part to digitization and the spread of information. We would like to be part of that change. Perhaps the greatest fault of didactic instruction is the avoidance of learner agency. The focal point of didactic, traditional education, is on the narrative of the author, lecturer, or teacher, instead of on the learner. By contrast, the focus of THATClass is on the learner. The most important voice is that of the learner. When facilitated carefully, learning is most powerful and lasting when learners tell a story about history they uncover. In effect, we advocate for learner agency; we empower learners. 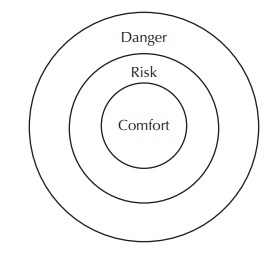 Additionally, we carefully take learners out of their learning comfort zones and encourage them to take learning risks ('Risky Learning' is described at the bottom of this page). Practice has shown that in order to empower learners most effectively they must engage in meaningful work such as those projects and/or problems present. These scenarios are either real and current or reality and fact-based. Most important is the end product or result, which is learner-created. Experts review and critique the work learners present. In this way their work is not a simulation, rather it is a relevant, polished contribution to the scholarly community in the humanities. The model visual serves as a guide for our projects. When planning a project, facilitators make conscious decisions about what resources need to be included and made available for learners to encounter the elements in our model. The most successful projects will incorporate all of its elements. In contrast, at its best, the traditional classroom environment incorporates only two or three of the elements at a time. The best way for learners to literally and authentically uncover humanities content is to have access to original primary sources. We form partnerships with Galleries, Libraries, Archives, and Museums (GLAMs) and corresponding experts in their field to provide this access. What better place to do just this than in the Nation's Capital, where GLAMs are in abundance and are often part of the public commons? Yet how often are traditional students exposed to these environments or experts when standards and content are to be covered? Exposure to GLAMs and forging new partnerships is fundamental to our approach. Commons environments are particularly important for this approach. Partnering with GLAMs is a natural phenomenon for study of the humanities in graduate school--we simply start earlier. One glaring omission to the visual of our model is 'technology'. Too often technology morphs from a tool to a skill. Let's be clear, technology is not a skill. So, why is it integral in our name? Without the tools that technology affords, much of the dissemination of knowledge would not be possible. Additionally, as soon as one lists a particular technological tool, it is already obsolete. 'Pedagogical Pollination', however, would not be possible without technology. This is a process that bridges student inquiry, local archives and experts, and emerging technologies to expand digital documentation of those materials and inject authenticity into the study of the humanities. That's THAT. topic, like to hear from others about the topic, know how to navigate occasional rough spots with ease. divert the conversation to a topic that is in your Comfort Zone. interest, and where they will consider options or ideas they haven’t thought of before. *Taken directly from the National School Reform Faculty's "Zones Exercise", bold added. THATClass Model by Patrick Cronin and Thomas Neville is licensed under a Creative Commons Attribution-NonCommercial-ShareAlike 3.0 Unported License.